Often, thinking seriously about outlandish problems is the only way to make progress in science. The rest of the time, it's hilarious. 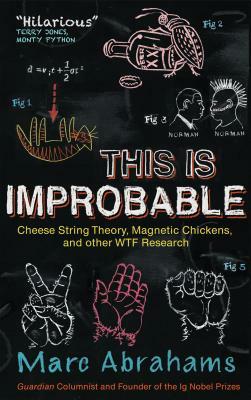 Marc Abrahams, the founder of the famous Ig Nobel prizes, offers an addictive, wryly funny expos of the oddest, most imaginative, and just plain improbable research from around the world. He looks into why books on ethics are more likely to get stolen and how randomly promoting people (rather than doing it based on merit) improves their work. He also shares the findings of weird experiments, from whether Vegas lap dancers earn higher tips at a certain time of the month to how mice were once outfitted with parachutes to find a better way to murder tree snakes. Abrahams' tour through this strangest of strange science will first make you laugh, and then make you think about your world in a completely new way. Marc Abrahams, the founder of the Ig Nobel prize, offers an addictive, wryly funny expos of the most improbable research from around the world, from why one psychologist insisted it was better to promote people randomly to whether Vegas lap dancers get higher tips at certain times of the month. As you travel from the bizarre to the profound, Abrahams will make you laugh, and then think about the world in a completely new way. Marc Abrahams is the editor and co-founder of the science humour magazine Annals of Improbable Research and a weekly columnist for the Guardian. He is the founder of the Ig Nobel Prizes, which honour achievements that make people laugh, and then think, and which are presented in an annual ceremony at Harvard University. He lives in Cambridge, Massachusetts with his wife, Robin.